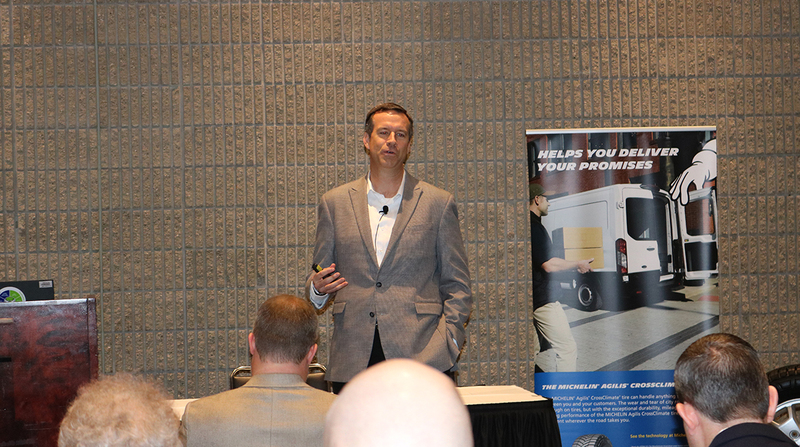 The Michelin Agilis CrossClimate tire is available in the United States and Canada on April 1, the company announced here at a March 17 press conference, part of American Trucking Associations’ 2019 Technology & Maintenance Council annual meeting. “The most fantastic thing about this tire is the combination of the safety and uptime performance,” said Adam Murphy, vice president of marketing for the business-to-business customer segment for Michelin. “For these customers that are operating in and around cities, being able to deliver for their customers safely and on time, is primordial,” he said, noting the tire is geared to vehicles operating in urban and last-mile delivery. The name, CrossClimate, is “a way for us to convey that this is a tire that can be used year-round in a multitude of different climates — because it performs well in the dry, in the wet and in the snow,” said Murphy, who pointed to safety benefits when it comes to the tire’s traction performance in wet and snow conditions in particular. The tire was designed for vehicles that are increasingly seen in local and parcel delivery fleets; food and beverage and temperature-controlled service; telecom and utility fleets; and trades, including landscaping, plumbing, electrical and HVAC, Michelin said in the press release. The Agilis CrossClimate is available in 16 light-truck sizes for passenger-vehicle platforms, such as the Ford F Series, Chevrolet Silverado, GMC Sierra and Mercedes Sprinter, Michelin said. Five C-metric sizes are available for lighter-duty commercial vehicles, such as the Ford Transit, Ram ProMaster and Nissan NV200. A C-metric tire has a directional tread design. “[This tire] is bringing a lot of the benefits that we offer in some of our existing Michelin brand tires for Class 8 vehicles,” Murphy said. Features of the Agilis CrossClimate tire include durability over extended mileage, improved protection from impacts and punctures and all-weather performance for year-round rough work conditions, as well as wet braking in high-stress applications, Michelin said. Murphy said some competitors offer commercial light truck tires and commercial delivery van tires that also perform in all weather conditions. “The benefit of the CrossClimate is superior performance in those conditions,” he said. The Agilis CrossClimate LT-metric tire lasted up to 19% longer under heavy loads than the three leading competitors’ comparable commercial tires, Michelin said. An LT-metric tire uses a nondirectional tread pattern. On snow-covered roads, the Agilis CrossClimate tire “demonstrated better snow traction than three leading competitors’ commercial tires,” the company said.